Muscle Memory is the process whereby your mind repeats a process so often that it becomes second nature or an advanced reflex. This technique is used by many of the best players out there (across many leagues, games and different platforms). Players who consistently get flick shots, wandeag’s or absolutely ridiculous kills usually have strong muscle memory. This memory isn’t stored in your muscles, but in your brain. The connection which creates this sort of reflex information is thus called muscle memory. 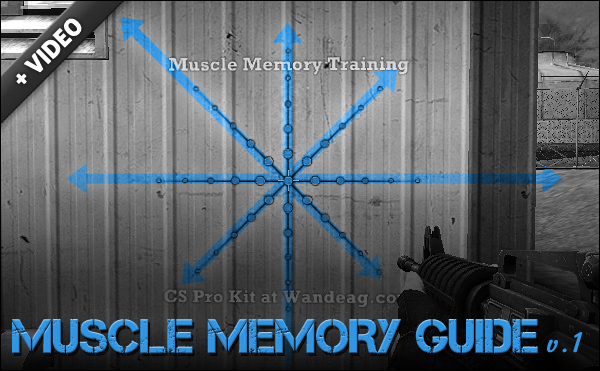 Below you will find the Wandeag.com Muscle Memory Star Spray. Compared to other training programs which require you to download a custom map, this star which comes in the form of a spray can be applied anywhere (especially on the maps that are important to you). After a good workout with the muscle memory star, hop onto a deathmatch server but it is very important to remain focused and practice your aim. Do not start spraying or getting lazy, keep up with the intensity you had practiced with. Although Deathmatch isn’t as intense as the drills you just performed, it will give you a chance to stay focused whilst other things are going on, for example: nades, multiple enemies and moving targets. When you play a mix or a match, your freezetime is usually 8 seconds. That is roughly 4 minutes of every game that goes to nothing but buying and talking strats (if you don’t have buy scripts, get them). Use this time to flick your crosshair somewhere randomly and then right back to a specific teammate’s head, repeat as much as you can. It is well possible that you may get no action playing your position for 2-3 rounds, as such you need to make sure that you stay warm during buytime. In closing, there is no replacement for actually playing the game but certain mechanical elements such as aiming can be rapidly improved by working with some customized tools such as the spray above. Try it out and if you have any comments or questions, feel free to write them below. I can’t seem to find this spray anywhere, and when I try to download the pack it just sends me into Windows media player..? This is looking to be very helpfull!, i cant wait to try it out! i have got a better reaction. i cant find it i have try downloaded it 20 times now plz help! and i know how to get a picture from google or something in counter strike but not this cause it need win rar plz help me! Hello mates! can someone make a spray like this for 1.6 pls? one like this and on simple with 8 dots, there is a 64 and 8 verions i think. it would be nice to be able to spray this in 1.6 🙂 take care ! yeah! just what I needed!!! I hope this works cause I really have bad aim on CSS. Where I install the muscle memory pack?? Previous post: Alert: Knife Campers are taking over!